#towerbridge, originally uploaded by kellan. Yesterday I was wandering around London’s Southbank, and whilst idly checking on the movements of friends through the pre-christmas throng, I noticed that @riverthames was headed for a low-tide. I wandered to the steps near @towerbridge and took some photos – including a long photo of the waves of the river lapping against the rocks at my feet, and went for coffee at the Design Museum. I read the paper, and checked twitter again. 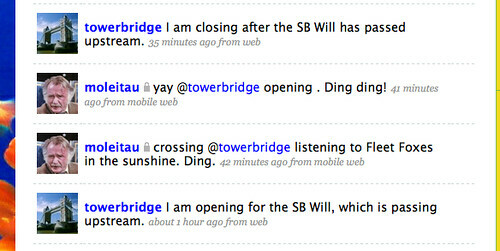 @towerbridge said that it was going to be opening shortly. I bolted out and caught the occasion on camera. The city is here for me to use, and it tells me so. BondBourne, originally uploaded by rodcorp. In the art bar at the RCA last night with Noam, we started discussing my recent obsession with the dematerialisation of super-villainy. I haven’t seen the latest Bond movie, but Noam had – and he started talking about how there’s no travel in the new Bond. Or more correctly, there’s lots of travel, but no destinations. 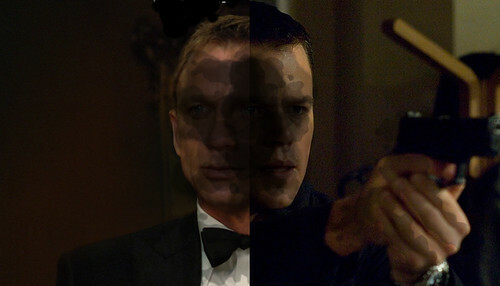 Bond and his various nemeses live in the inter-zone, a bland Super-Cannes. As opposed to the Connery/Moore, hell – even Brosnan films, where you had long establishing shots of exotic destinations, you just feel like you are in the international late-capitalist nonplace. We started talking about the Bourne movies, and how, particularly the first and the last are set in Schengen – a connected, border-less Mitteleurope that can be hacked and accessed and traversed – not without effort, but with determination, stolen vehicles and the right train timetables. Again, the triumph of dematerialisation – but with a twist. Rather than Bond’s private infrastructure expensive cars and toys, Bourne uses public infrastructure as a superpower. A battered watch and an accurate U-Bahn time-table are all he needs for a perfectly-timed, death-defying evasion of the authorities. But in addition, Bourne wraps cities, autobahns, ferries and train terminuses around him as the ultimate body-armour, in ways that Old Etonians could never even dream of. However, we've almost all finished the 2008 level, despite the Boss turning out to be The Catastrophic Collapse of Late-Capitalism! I'm expecting we get to unlock some pretty sweet achievements and weaponry for 2009.